The Grammy Awards have generally had a pretty troubled relationship with hip-hop, to say the least. On one level, it's a little understandable: the awards are voted on by the entire Grammy committee, which means that genres (like hip-hop) usually end up represented by acts and songs easily recognizable to outsiders. On the other hand, the Grammys can create an inaccurate view of hip-hop (and what's great—or not great—about it). Even as the genre took over popular music for a period in the late '90s and early '00s, the Grammy Awards seemed only kind of aware of hip-hop's biggest stars. From Jay-Z to 50 Cent to Will Smith, many of the biggest acts in hip-hop have expressed frustration with the awards at various times; in 1989, Smith boycotted because hip-hop's first year at the Grammy's wasn't even to be broadcast on television. The lingering feeling of distrust continues to this day (in 2011, hip-hop exec Steve Stout even wrote an open letter to the voting committee, expressing frustration at their unwillingness to change with the times). 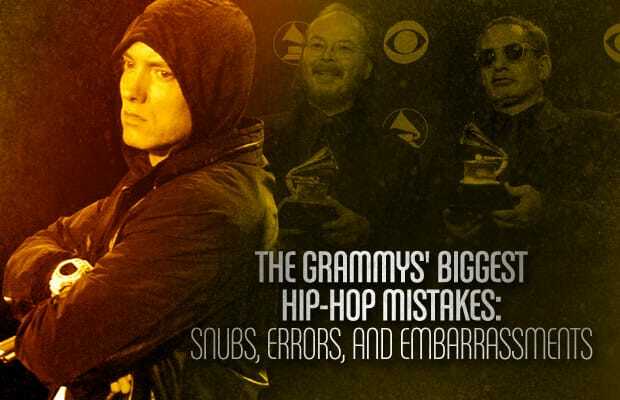 These are The Grammys Biggest Hip-Hop Mistakes: Snubs, Errors, and Embarassments. Here's hoping they get better about it. RELATED: Artwork: Justin Timberlake "The 20/20 Experience"